Discount Magic - Professional Light-Pair Set(Red). The MOST powerful Light at the fingertips you've ever seen! A professional quality device using state-of-the-art electronics - you will be impressed! The magician shows his hands empty, reaches into the middle air, magically pull out a bright light at his fingertips! Tosses it from hand to hand, and make it disappear at his command. 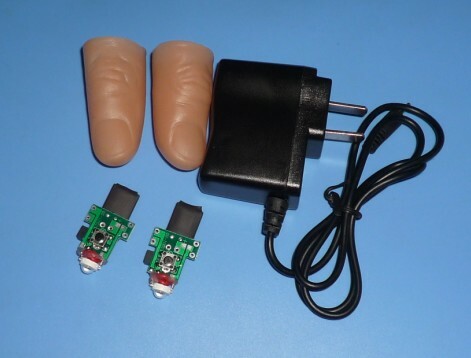 What you receive: It comes complete with a charger (USB not mains powered) , 2 thumb tip light devices(red), 2 thumb tips and instruction. Professional Light-Pair Set(Red) The MOST powerful Light at the fingertips you've ever seen!